The fact of the matter is, bouncing back from a cyber-attack is no easy feat. It is extremely expensive and damaging for businesses worldwide especially small businesses who are the preferred targets for those who seek to steal information. Nearly 50 per cent of small businesses have experienced a cyber-attack and that’s a major issue given that the cost of a cyber attack can be high enough to put a company out of business. 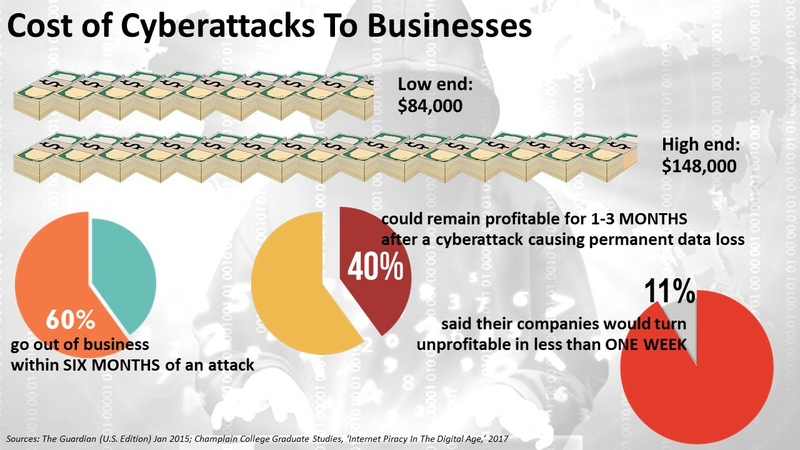 According to the National Cyber Security Alliance, 60 per cent of small and mid-sized businesses that are hacked, fold and go out of business within the first six months after being attacked. This should be concerning to businesses everywhere because even if you don’t immediately feel them, there are people out there who are after your customer’s records and at the end of the day it is your responsibility to see to the protection of that data. CCG is there to help. CCG will ensure your business’s reputation and livelihood, protecting your employees, and customers. One of the main reasons why small businesses are so vulnerable is because they usually lack sufficient security measures and lack of personnel who are properly trained in cyber defence. Another thing that most small businesses like to do is neglect the use of a third-party service to back up files which does nothing to benefit you in the incident of an attack. This is why we at CCG are promoting the innovative technology of Phen and Checkmate which will take cybersecurity protection in a new direction and to the next level. With Artificial Intelligence leading the defence, you will be one step ahead of any intruder in the network.